A model wears neoprene at an Emporio Armani fashion show. 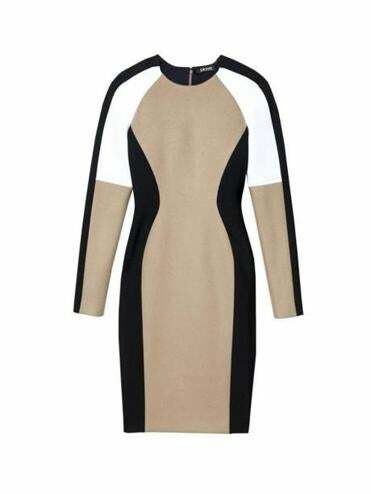 A neoprene dress from DKNY, $595. A surfer wouldn’t dream of tackling icy waters without the cozy cocoon of a neoprene wet suit. This synthetic rubber material is form-fitting and resilient, not to mention warm and water-resistant. From 3.1 Phillip Lim’s sweatshirts to J Brand’s 801 Scuba jeans, casual becomes, surprisingly, a bit more refined with neoprene. T by Alexander Wang’s pleated skirt and Faith Connection’s butterfly-print dress take the next step into formal wear, while the material’s flexibility is celebrated in Reed Krakoff’s leather and neoprene ankle boots and Emporio Armani’s boots in PVC and neoprene velvet. It’s also a versatile fabric with a lot of dimensions. Uekermann has been eyeing the sculptural iridescent seamed waist dress by Cynthia Rowley for her own closet. Rowley, the uncrowned queen of neoprene, has long loved surfing so using the wet-suit material in her line was a natural transition. Futuristic and funky but still wearable, the bonded stretch leggings are her latest neoprene style gambit. Giorgio Armani is getting his feet wet with his first use of neoprene. Emporio Armani’s AW13 Kajal collection is full of exciting structure for men and women. Local style expert Erica Corsano recently cohosted a fashion show at the store’s Copley Place location that featured rough-cut neoprene bonded with velvet in deep green, aubergine, and ruby skirts, peacoats, and dresses. The material isn’t going away anytime soon. Several designers, including John Galliano and Pucci showed it on the runways for their Spring 2014 collections. Cheryl Fenton can be reached at Cheryl@CherylFenton.com.